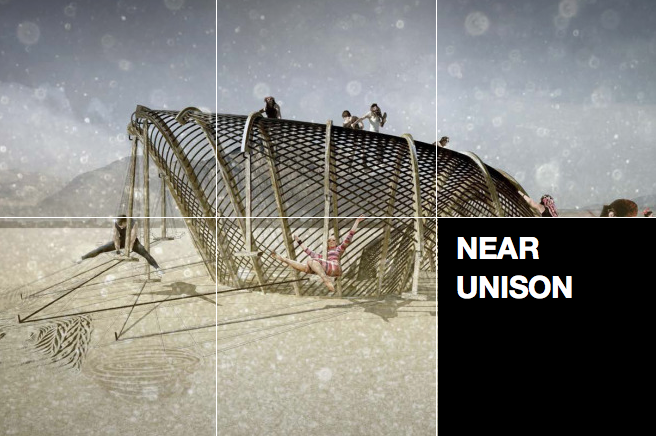 Dan Dodds has created Near Unison, a proposed installation piece for Burning Man 2013. The piece will enable participants to "visualize the harmonic relationships between them" at Burning 2013. Near Unison's prototype debuted at Kinetica Art Fair 2013 in London. The relationship between two individuals is drawn out in a bed of sand by two swinging pendulums. The pair of connected swings allowed visitors to become part of a large scale harmonograph that scratched a unique drawing into the sand below. The physical and psychological differences "between the two people using the swings accounted for the different outcomes: with weight, height, starting time, patience and playfulness all playing their part. The drawings created existed for a brief moment as a fingerprint for the two people". Do you want to see Near Unison at Burning Man this summer? Newer:Ai Weiwei: War of Art and Social MediaOlder:Following Osmann: Couple shares love, travel and photography in Osmann's photo series "Follow Me"